The knot is a critical part of the fisherman's rig. No matter how superb the rod, reel, and tackle, if the knot fails, the game is over. In Fishing Knots, expert angler Lefty Kreh offers a complete guide to tying essential knots for light tackle and fly fishing, from simple loop knots to the complicated, with precise illustrations to demonstrate each step of the tying process. Lefty gives helpful tying tips for achieving maximum line strength and describes effective methods for connecting lines of various diameters, securing knots in different types of wire, and attaching hooks, swivels, and flies. 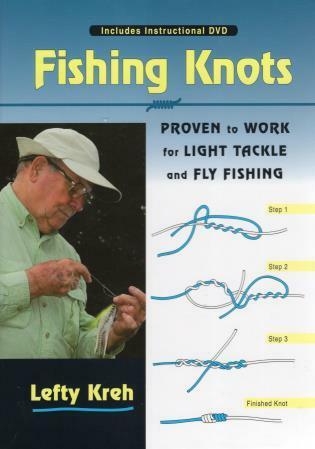 Included is an instructional 72-minute DVD that features Lefty Kreh tying 30 of his favorite knots and reinforcing techniques explained in the book. Lefty Kreh has been an outdoor writer for more than 45 years and was named "Angler of the Year" by Fly Rod and Reel magazine in 1997. He currently can be seen fishing with Tom Brokaw, Yvon Chouinard (founder of Patagonia), and Michael Keaton on the Outdoor Channel's Buccaneers & Bones. He lives in Hunt Valley, Maryland. Dave Hall is a nature and fly-fishing illustrator in Glide, Oregon.